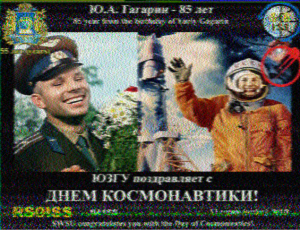 If you are wanting to try your hand at SSTV then give the ISS a go. tune to 145.800Mhz FM! I use a couple of Android apps, Robot36 for decoding the SSTV Image (P120 mode) and the ISS Detector Satellite Tracker. It helps to know when the ISS is overhead! I managed to decode the image below from the ISS tonight (12 April) from the balcony. It was a reasonably high pass but the modulation was down. Nonetheless decoded. Check in here for the latest news on SSTV from the ISS.